I was bustling in and out of my morning consultations when I heard my colleague frantically researching the product containing ‘monoammonium phosphate’. She informed me that there will be a cat arriving in the next hour or so that has ingested that product and is now bleeding from its mouth. Please be aware that I will be sharing some very unappetising photographs so you may want to abstain from reading this post if you can’t cope. When the patient arrived, I happened to be free so I immediately asked the owner to come into the consultation room. 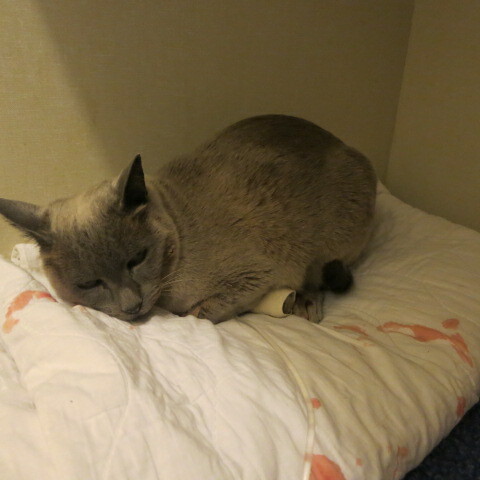 I opened the cat box and out came ‘Finn’, a 10 year old male desexed Tonkinese. He was drooling heaps of blood tinged saliva and his breathe smelt atrocious. I quickly opened his mouth and was shocked by the sight of this horribly swollen bluish tongue. 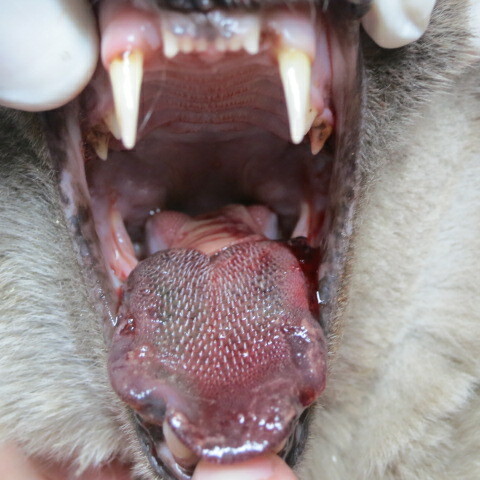 Here is a picture of his tongue when I first examined him. I quickly handed him to my colleagues to get him started on treatment which consisted of IV fluids, pain relief and several types of gastric protectants. Then I jumped back into the consultation room to continue collecting his history. His owner informed me that she discovered him drooling bloody discolored fluid at around midnight. She thought he must have had access to the material used in her kid’s science project. She explained that she stayed up with him during the night and attempted to syringe water into his mouth until about 2 a.m. At that stage, I couldn’t help but ask: ‘Why didn’t you contact us earlier on the after hour’s emergency number to get some advice?’ The owner explained she had two children in bed and no one to look after them and just didn’t know what to do. I replied to her notifying her that the veterinary after hour’s service is to assist clients in those times of crisis with their pets. We could have easily organised to go over and pick ‘Finn’ up given her circumstances. Just as I finished saying that, the poor lady burst into tears and I felt really bad for her. I explained how dire the situation was and that his prognosis may be significantly worse as he was not treated straightaway. I forewarned her that his condition is very critical and we may have to refer ‘Finn’ to a specialist for overnight monitoring. She nodded to everything I said and clearly stated that she wanted us to do whatever it takes to help ‘Finn’ pull through. While my colleagues managed ‘Finn’, I emailed photographs of his lesions to Advanced Vetcare Veterinary Referral Centre and discussed the case with them over the phone. As I expected, they strongly recommended he is admitted to their intensive care unit. 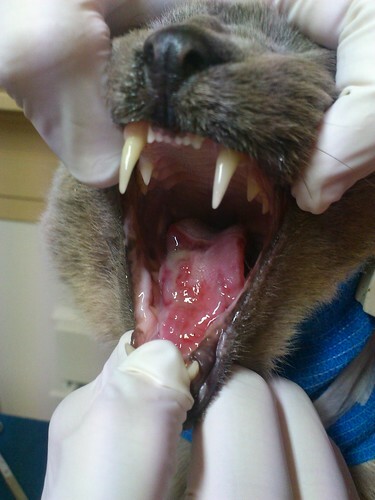 They warned us the prognosis is usually very guarded for cats with severe oral and gastrointestinal ulceration especially if the tongue is gangrenous. At that particular moment in time, I still hadn’t thoroughly assessed the patient myself as my colleagues were treating him. He was agitated after they collected a blood sample from him and so I decided it was best to give him a break before I tormented him with another examination. We are usually very concerned about the development of acute kidney failure secondary to any poisoning. Thankfully, Finn’s blood results came back normal. As you can see, ‘Finn’ was not impressed with our services. ‘Finn’ was placed in a cage and closely monitored. He didn’t deteriorate but appeared quite miserable. Just as I was about to thoroughly assess ‘Finn’; my colleague requested my assistance in managing this critical patient that had just turned up. A 12 year old Maltese that was run over by a four wheel drive that her owner was driving! Needless to say, the owner of that dog was in absolute shambles. He was begging us not to let her die. I got side tracked from ‘Finn’ for a couple of hours. 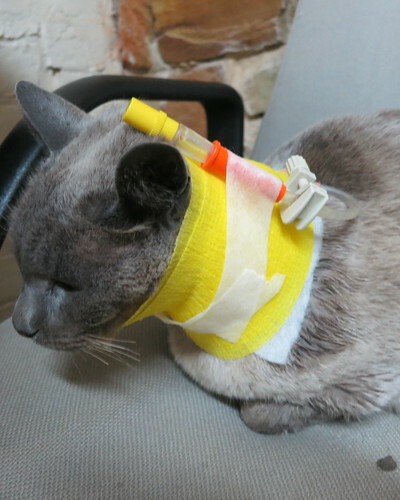 However, I had already organised for his owner to pick him up later that afternoon and drive him to the specialist center for intensive monitoring overnight. An hour before Finn’s owner was due to pick him up, I was reassessing him and I discovered a constricting substance at the base of his tongue. Check out the photographs that clearly captured the constricting substance around the base of his tongue. I was not sure if that material wrapped around his tongue was part of his tongue or foreign. I decided it was important to free up the base of the tongue from that substance by directly incising it. Fortunately, ‘Finn’ cooperated and allowed me to do just that without requiring any sedation. As soon as I nicked the constricting substance, the tension was released and lots of blood oozed from that area. I was suspicious that the material I incised was fibrous tissue and not foreign material as I witnessed direct bleeding from around the structure when I cut it. 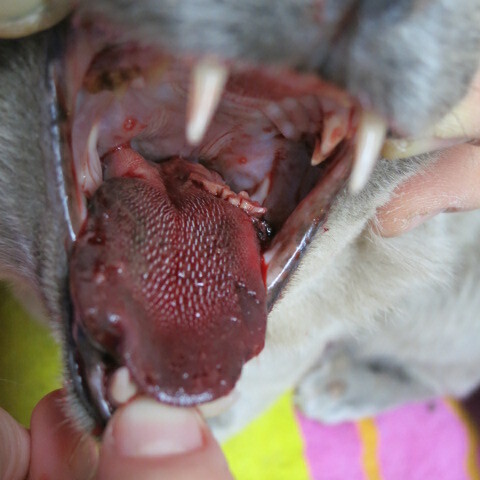 These are photographs of Finn’s tongue right after I cut the fibrous material. About 45 minutes later, Finn’s owner arrived to pick him up. I quickly reassessed his tongue before loading him into his cage and was quite pleased to see that the tip of his tongue was now looking pinker and less engorged. Can you appreciate the improvement in the color of his tongue indicating better circulation? Compare this photograph to the previous ones and you will see the difference. I discussed everything we had performed on him with his owner and gave her his history to pass on to the referral clinic. The next day, I attended a behavioral consultation of a patient of mine at Advanced Vetcare Veterinary Referral Centre after which I checked up on ‘Finn’s progress. 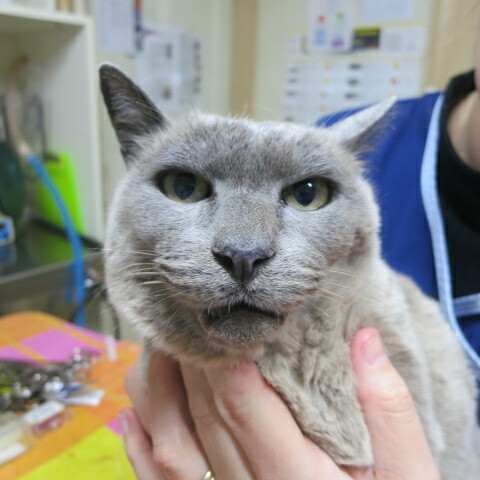 I found out they had put him under full anaesthetic and passed an endoscope down his throat and discovered he had no signs of esophageal ulceration. His tongue was the only affected structure in his mouth. If he had ingested toxic material, you would expect his inner cheeks and proximal oesophagus to be involved. 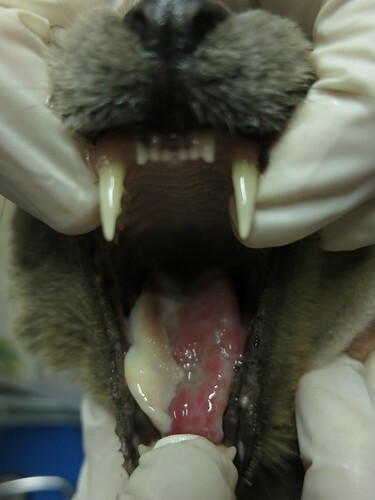 The absence of ulceration in his oral cavity precluded the possibility of him having ingested any poison. 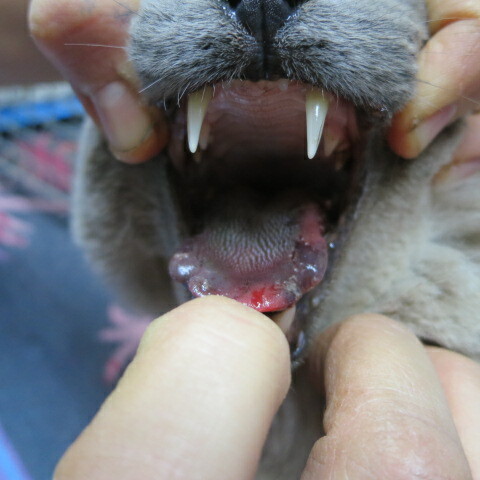 They noted that they had retrieved some foreign glove like material attached to the bottom of his tongue. They asked me if ‘Finn’ had at any time during his oral examinations bitten me. They were trying to ascertain how the foreign glove-like material ended up in his mouth. The exact cause of his tongue injury was still unknown. I instantly reiterated that I had in fact lanced some material that was constricting the base of his tongue. Basically ‘Finn’ was in a very critical state. 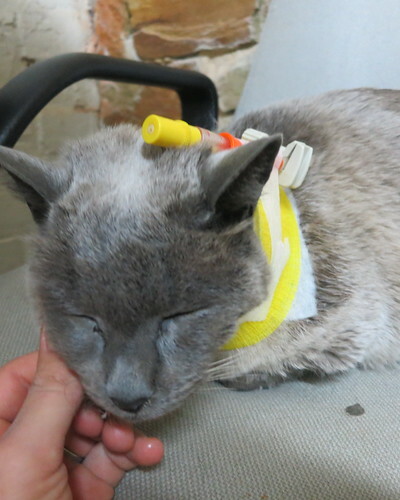 He had a feeding tube placed and his owner was given a very guarded prognosis. If aggressive medical therapy failed to salvage his tongue, they recommended euthanasia. He was sent home on an extended course of antibiotics plus pain relief. In two weeks’ time, he was scheduled for a revisit consultation at their practice to reassess his tongue and determine if he was responding to the therapy. His owner was managing him very well at home. 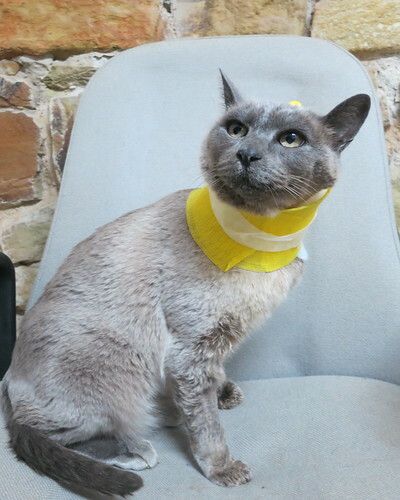 After 6 days, she was concerned that ‘Finn’ was quite lethargic and had been scratching the bandage placed around his neck to protect his feeding tube. I recommended she bring him in for a check-up. 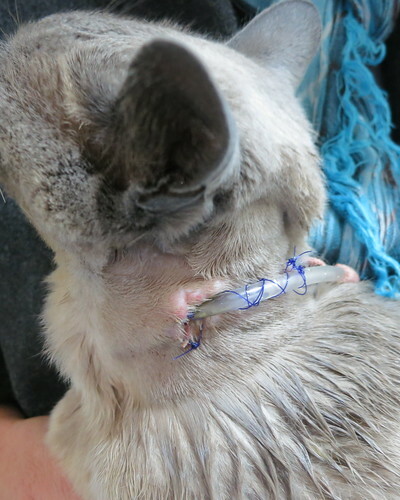 I removed the bandage around his neck to ensure his feeding tube was still in place and discovered pus discharge around the entry point of his feeding tube. This is what it looked like after I cleaned up the entry point with antiseptic solution. I then re-applied a new bandage and I think ‘Finn’ appreciated it immensely. This is what Finn’s tongue looked like. The white material is a diphtheritic membrane. It was still early days to predict whether his tongue was going to fully heal. Just two days before his scheduled revisit at the referral centre, I had the opportunity to have another look at ‘Finn’ and this is what his tongue looked like then. 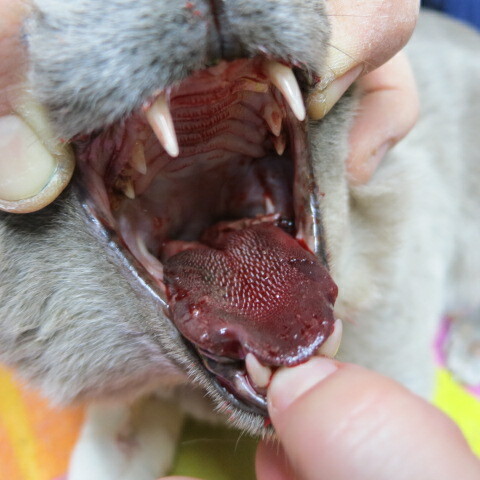 At that stage, I was quite concerned about the lesion at the base of his tongue (right side) as it appeared like there was a large ulcer forming. On the bright side, his owner was very happy to inform me that he had been able to move his tongue and even eat a small amount of chicken on his own. I received a report a couple of days later from the referral centre notifying me that ‘Finn’ had managed to pull out his feeding tube the night before his scheduled revisit with them. 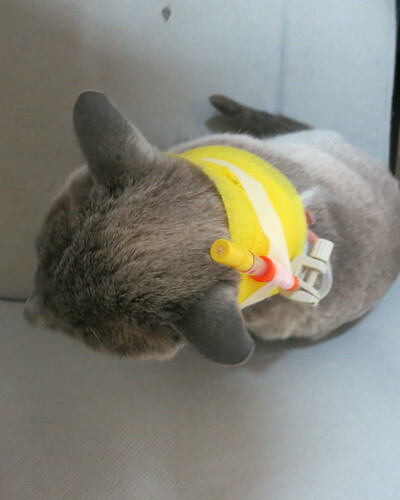 He had been able to eat quite well on his own and so they didn’t see a need to replace his feeding tube. I firmly believe ‘Finn’ is going to make a full recovery. However, the specialists have still clearly indicated his prognosis is guarded and he is definitely still not out of the woods. We are all impatiently hoping that Finn’s curiosity does not cost him his life! I do cringe when I read your treatment stories, but I always appreciate your details. It makes me so much less frightened for my own cats if something were to happen! Hey Bernadette. I’m glad you are deciphering the relevant information from my blogs. Fascinating story! Loved the photographs, the detail in them illustrated the points so much better than copy ever could. I want to see more!! I am curious too, what the material was. If only they could talk…sigh. Keep up the good work! Thanks heaps Mollie. I agree a picture definitely says it all. I wish Finn could tell us how we got himself in test pickle of a situation. You certainly see some heartbreaking stories in your job. I hope this cat makes it. He reminds me so much of my own from years ago. We hope so too. Finn has a very strong will & I believe he is going to be okay. Time will tell. What a riveting story! I hope Finn pulls through okay. Thanks Laura. Finn’s tough so hopefully his tongue heals. Congratulations for this positive outcome in such a difficult case! The take-home message: look at all the possibilities. Heroic work….saving Finn. He may have used up a numer of his nine lives with this one. Hey Gretchen. Finn sure used up one of his nine lives. I look forward to his full recovery. whew! ANOTHER hair-raising episode! Great work Dr. Rayya! Thanks Sherri. Finn was definitely a unique case. Finn certainly does look a lot better in the last photo, he must of been is so much pain when he first arrived. I hope he continues to get better. Thanks Mags. Poor Finn was in a terrible state when we first saw him. He has come along very well since. Finn must have been in terrible pain; I wish the owner had called you sooner. I hope he continues to make a complete and full recovery. Did the 12 year old Maltese survive being run over by a four-wheel drive? Hey Barb. Finn’s owner has realised the error in her judgement & has been doing a terrific job at helping him recover. Yes the Maltese survived but had multiple rib fractures. Dr Rayya, it was not as gruesome as some pictures you have posted. 🙂 I’m glad Finn is on his way to a full recovery. Good job!! Wow Minnie sounds like an absolute legend. Thank god you caught her in the act or else she may have required surgical intervention. Sounds like you have looked after her very well. Great work! Finn is very spoilt too and recovering very well all thanks to the love and care of his very dedicated owner. I really hope he pulls through – you have made such amazing and valiant efforts to save him. I wonder what the glove-like material was that he tried to eat? Hey Jo. Finn is recovering very well. I definitely believe he will pull through. Unfortunately we will never know where that material came from and how Finn managed to get it wrapped around the base of his tongue! Poor Finn 😦 I hope he makes a full recovery. What an interesting life you lead! Cats can get themselves into more mischief than a toddler! I totally agree. Cats are very naughty & managing them is as difficult or worse than that of a toddler. O, that poor darling. I hope he’ll be healing completely. Thanks for sharing the story, Rayya, it was very informative as well as the photos. Scary photos – that poor fellow will be jolly lucky to make a full recovery. How close things can get. I have many friends who are vets, all of them graduates of the Texas A&M University College of Veterinary Medicine. None of them have ever shown me something as interesting as this was. Right now my regular visits are about 18 days apart, but rest assured that I will be back to do some more camping! Russell enjoy your blogging adventures. Take care. Poor thing. I hope this cat gets his miracle. Yey!! The weekend starts on such a happy note! :) God Bless you!! Wow, that is quite the story, glad it all turned out OK. I wanted to say thanks for stopping my blog too. Have an awesome day!! Finn sure gave me a story to write about :-). Loved your blog and glad you enjoyed mine. Roxy is just too adorable. Poor Finn – I like some Mischief, but wow buddy, what did you get up to? I’m just glad you were able to look after him!! Very amazing and nice history. I think cats sometimes make difficult for vets. Congratulations for the great post, great and nice photos!!! Pere, thanks heaps for your great feedback. You are absolutely right, our feline patients can be quite tricky to manage sometimes. Keep up the great work. What a good boy, for allowing you to help him! I hope he recovers all the way, and quickly! Hi I’m not responding to the above post but wasn’t sure where to post my question. I’m really upset and alarmed; my vet gave my 9 lb cichuahua a vetalog shot and one week later another vetalog with dex I believe. At what point is she drinking too much water? I mean there comes a point in humans where too much water can cause hyponatremia and organ failure. This is really starting to scare me that this could happen or that this is permanent. It’s been one week of this now. About two weeks maybe since the initial shot. My dog rarely has these injections only maybe three times in her 8 years of life. I feel like the vet was too flippant about this potent drug. The itching is way less miserable then these side effects. I also can’t sleep because I can’t lock my dog up 24 hrs a day and she has to pee like every hour or two. Not once did either vet (there r two) discuss possible side effects or to keep water always accessible even at night instead of putting my dog in bed with me. Please advise me on whether I’m worrying for nothing. I’m at my wits end over this. My poor dog. I am so sorry to hear about your distress.Cortisone injections often cause increase drinking and eating and consequently the need to urinate more. There are many different cortisone injections that have varied durations of action. You must contact your vets to discuss your concerns and to determine which type of cortisone was utilised sob you know when the effects should wear off. Unfortunately, sometimes cortisone injections can cause iatrogenic cushings condition. Given your chihuahua’ age, I highly recommend conducting a blood test to ensure she hasn’t developed any underlying medical condition. I hope this information is helpful and your pooch is back to her normal old self soon. Please keep me posted on her progress.